provides the fastest and strongest connections for your smart phone,tablet,notebook and other devices. Have an amazing Experience with AIS SUPER WiFi. for your smart phone,tablet,notebook and other devices. to enjoy immediate 3G and WiFi access. WiFi service is only available with equipment that has WiFi capability. WiFi service is only available to one user/account. WiFi package gives access to WiFi service only through the [email protected] AIS SUPER WiFi network. WiFi use will be Time Base calculated, from the time time you login to the time you logout. 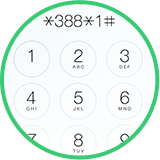 In case you forget your Password, dial *388*1# and request a new password that will be sent by SMS. promotion is changed or owner is changed. WiFi packages service which provided by Advanced Info Service Plc. and/or Advanced Wireless Network Co.,Ltd. (referred to as AIS). Provide the service to subscribers or prepaid and postpaid subscribers of AIS mobile phone service which can use the service according to the period and bill cycle it applied for the service regarding the subscribed process appeared in clause 2 or use the service according to its main package bundling WiFi. AIS WiFi 1 hour package: Service Fee: 9 baht for (the maximum speed not exceeding 10 Mbps) which shall be valid since the subscribers received a confirmation of subscription SMS from AIS. AIS WiFi 5 hour package: Service Fee: 19 baht (the maximum speed not exceeding 10 Mbps) which shall be valid since the subscribers received a confirmation of subscription SMS from AIS. AIS WiFi 1 day package: Service Fee: 29 baht (the maximum speed not exceeding 10 Mbps) which shall be valid since the subscribers received a confirmation of subscription SMS from AIS. AIS WiFi unlimited monthly package (automatically extends the service): Service Fee: 69 baht for every 30 days. For prepaid service subscribers shall be collected at 16.10 Baht for every 7 days (the maximum speed not exceeding 10 Mbps) and shall be valid since the subscribers received a confirmation of subscription SMS from AIS. 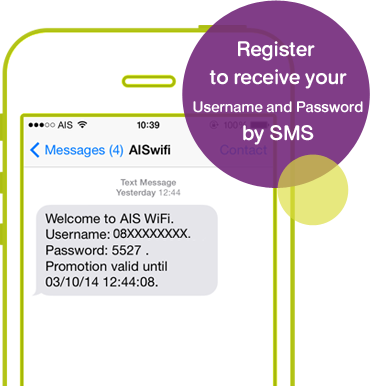 AIS SUPER WiFi unlimited monthly package (automatically extends the service): Service Fee: 99 baht for every 30 days. For prepaid service subscribers shall be collected at 23.10 Baht for every 7 days (the maximum speed not exceeding 650 Mbps) and shall be valid since the subscribers received a confirmation of subscription SMS from AIS. The maximum speed of WiFi service provided to AIS SUPER WiFi subscribers be at the speed of downloading not exceeding 650 Mbps and uploading not exceeding 100 Mbps per subscriber and the speed of downloading not exceeding 10 Mbps and uploading not exceeding 1 Mbps per subscriber in the coverage of AIS WiFi. The subscriber is entitled to connect AIS SUPER WiFi with only 1 device per account per using per time and shall not be allowed to connect any device for expanding or transferring AIS SUPER WiFi signal to any other person which is not AIS SUPER WiFi’ subscriber. In case of forgetting the Password, the subscribers shall request a new Password by dialing *388*1# or contact with AIS Call Center 1175. Logout at wifi.ais.co.th for WiFi service. During using WiFi service, subscribers may experience session time out after the subscribers not using the service for 15 minutes and the system shall automatically log out for checking and recording the service usage. In case the subscribers shall reactivate the service, it shall log out and log in again. Switch off the device, equipment and the peripheral equipment when not in use for long period of time or when finishing the work. Subscriber shall keep the OTP/Password in confidence, do not use password with the others, set password carefully, do not use the same password or easily to guess or use the same password in every process when using device or every computer or device system which is authorized to use, change the password at a suitable period of time or when there is an appropriate situation. Commit any offense as prescribed in the Computer Crime Act B.E.2550 and any other relevant laws. Subscriber agrees to comply with this WiFi service’s Terms and Conditions. Subscriber shall not perform any unsuitable or illegal activity or against good moral, culture and tradition or against the regulations, rules or any orders which are currently applicable through this WiFi service and any violation of which shall entitle AIS to suspend the use of WiFi service forthwith. In the case of AIS subscriber's SIM card is damaged or lost for any reasons. In the case of the subscriber uses the same number but changes the SIM card. The Subscriber is able to use the WiFi service according to the speed provided for WiFi package which it subscribed. The quality and speed of data usage may be reduced or unavailable depend on quantity, amount of Subscribers, the distance between the WiFi network and Subscribers’ premises, quality and efficiency of connecting devices, the server of website which the Subscribers visit including the location of receive WiFi signal. AIS reserves the right to limit the speed of data usage through WiFi service for Bit Torrent program, video streaming, uploading/downloading image and/or audio files or any other similar programs which shall be depend on AIS’ Fair Usage Policy in order to prioritize the collective interest of general Subscribers. AIS will do all in our power to protect and the company's and associates' WiFi systems as best as possible. At the same time, all subscribers must do all they can to be careful and protect their personal property, including all equipment including WiFi systems from hacking and viruses. AIS reserve the right to not be responsible for any damage or loss of any data through the result of lateness, service obstruction or system failure when downloading data or dangerous material from the Internet that the system. The subscriber or user must bear sole responsibility and must be certain that all material or data downloaded comes from the site to which they have connected. AIS reserves the right to terminate a subscriber’s package in the case they are notified or there is a change in the payment rates after an announcement and/or change in Government policy. AIS reserves the right to correct, change, curb or terminate any service package if the company considers there has been any dishonesty or false documentation that has been submitted to subscribe for a service package or if the service has been used illegally, or against any law, or is used counter to the terms and conditions of the sales promotion. AIS reserves the right to correct, change or terminate any, terms and conditions including fee service fee rates for these package with prior notification to subscribers not less than 30 days of its consideration.